On the Cover of a Magazine – Who’s that Girl? Featured on the cover of this November’s Longshot Island literary magazine, is one of Jane’s most personal artworks, The Sideboard I. An exciting new press, Longshot Island publishes contemporary fiction and non-fiction by talented writers from across the globe. When editor-in-chief D.S.White approached Jane to feature her artwork, she was delighted he wanted to include several Biro drawings from her series ‘Tales from the East’. The Sideboard triptych portrays the anonymous memories of a small child at play within the safety of home, before the onset of war. The drawings were inspired by the little girl in the red coat from the film Schindler’s List 1993 Steven Spielberg, as she wanders through the Kraków Ghetto while it is being liquidated by the German Army during WWII. The triptych features Jane’s niece Jemma, and contemplates victims of conflict as individuals rather than statistics. Since creating The Sideboard triptych in 2008 both Jemma (above) and her brother Jamie continue to feature in Jane’s work, alluding to the close family bond she shares with them. Jane was also delighted to receive photographs from Taiwan of the editor’s friends, including the next generation, enjoying the magazine. Huge thanks to the Longshot Island team, friends of the team and Jemma! 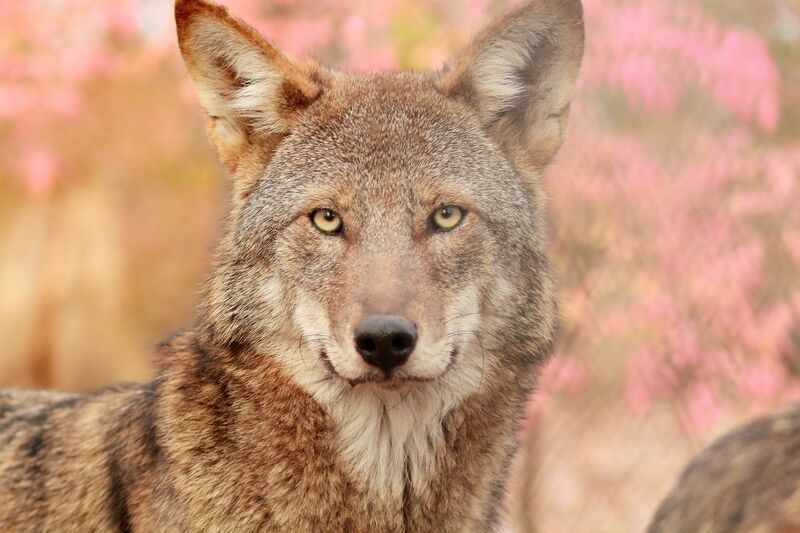 Beautiful, adaptable and rare, the elusive Red wolf was once common to the eastern United States where it roamed for thousands of years. 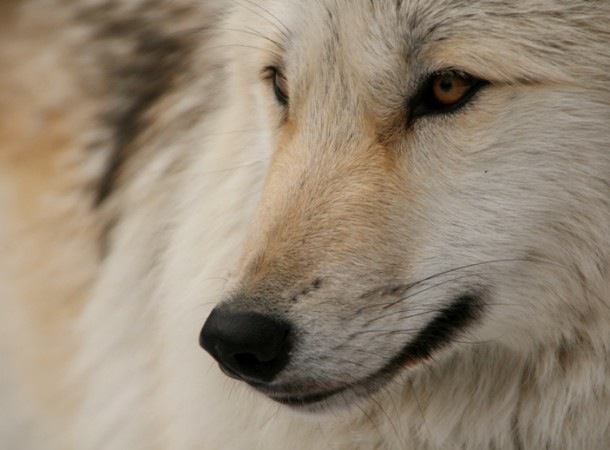 Now, critically endangered the wild population of just 45 individuals inhabits northeastern North Carolina, while a captive breeding program includes 200 wolves. 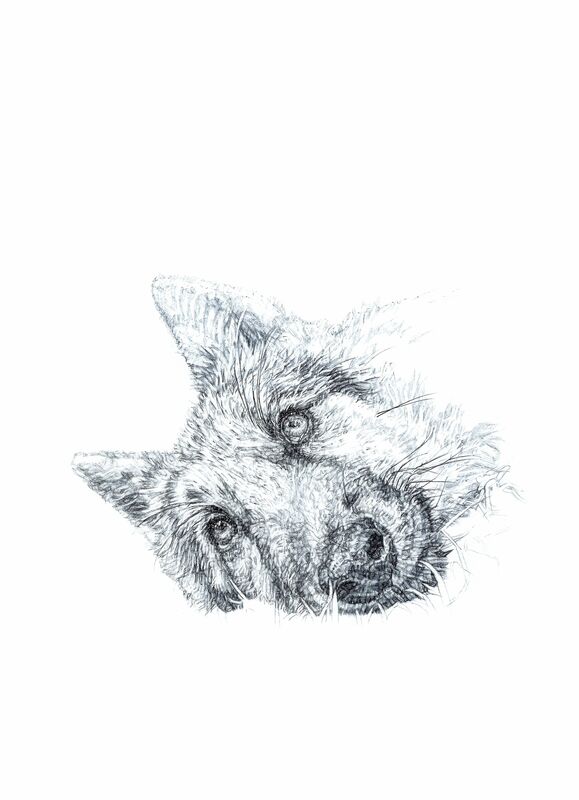 Jane’s red Biro (ballpoint pen) drawing entitled ‘Red Wolf’ made for the Wolf Conservation Center, New York captures the beauty and fragility of this enigmatic creature whose wide-ranging habitat once included swampland. 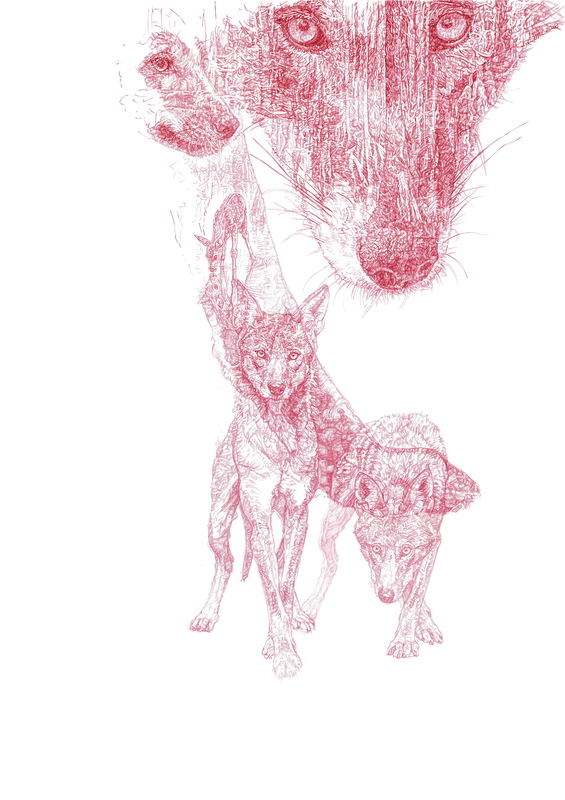 With kind permission of WCC Jane used images of their Red wolf pack as inspiration for her drawing. She asked Executive Director Maggie Howell and Curator Rebecca Bose what their own personal favourite qualities of the Red wolf were, and they both agreed “a strong sense of family”. Therefore ‘Red Wolf’ celebrates the three stages of a wolf’s life from pup to juvenile through to adulthood. While an adult Red Wolf treads quietly across a page of history, through a forest of Cypress trees covered in Spanish moss like lacework through its fur, its young pup waits in the den. A Whitetail fawn drinking from a forest pool suggests the tranquillity of nature. Sibling juvenile Red wolves tentatively emerge from the forest, inquisitively exploring the world around them while the adult watches over them. A limited edition of 50 signed and numbered ‘Red Wolf’ prints is now available from Jane’s SHOP. 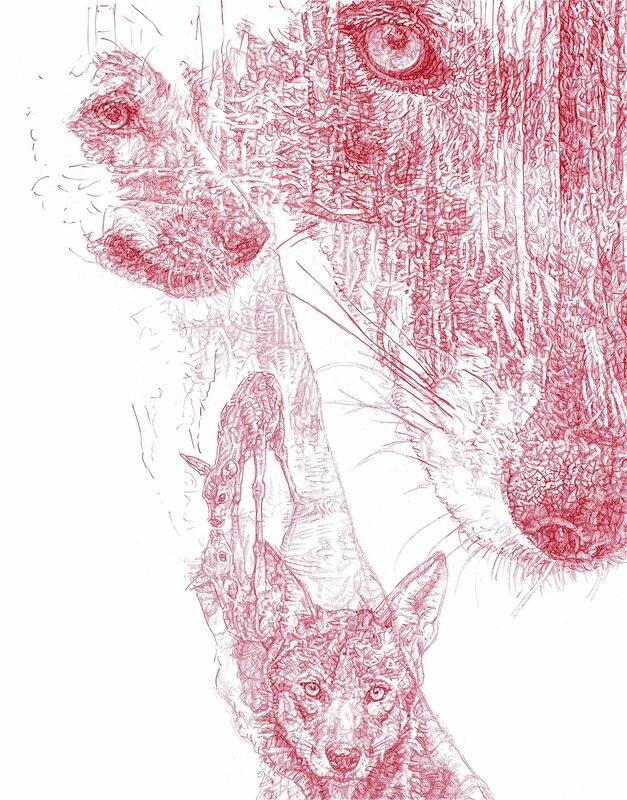 Each print sold benefits WCC’s vital work ensuring the survival of Red wolves. Jane Lee McCracken’s drawing ‘A Spoonful of Laika’, depicts Laika sitting in the bowl of a Russian Khokhloma wooden painted spoon from Jane’s Russian artefact collection. Laika’s innocent stance represents the unknowing sacrifice she would make for human gains during the Space Race. The spoon is an allegory to the song from ‘Mary Poppins’, suggesting a ‘spoonful of dogs’ is as remedial as sugar for the unconditional love and devotion they instinctively give humans. This artwork also signifies that man’s reciprocation towards canine loyalty is not always with acts of kindness and care. Laika’s heroism was immortalised in 2008 with her own statue in Star City, Russia. Nick Abadzis’s beautiful graphic novel, ‘Laika’, 2007 memorialises the life of the Moscow street dog of Siberian Husky mix, who was named after the Russian word for ‘Barker’ or ‘Husky’, by the scientists who trained her. Oleg Gazenko at a press conference in 1960 holding Belka and Strelka who safely returned to earth after their space flight. Image courtesy of Chris Dubbs collection. New greetings card range by Jane Lee McCracken – four designs depicting original Biro drawings. This spring sees the launch of Jane’s new greetings card range featuring a selection of her most iconic Biro drawings to date. Printed in the UK, these high quality 15 x 21cm cards capture the intricate detail of each poignant drawing. 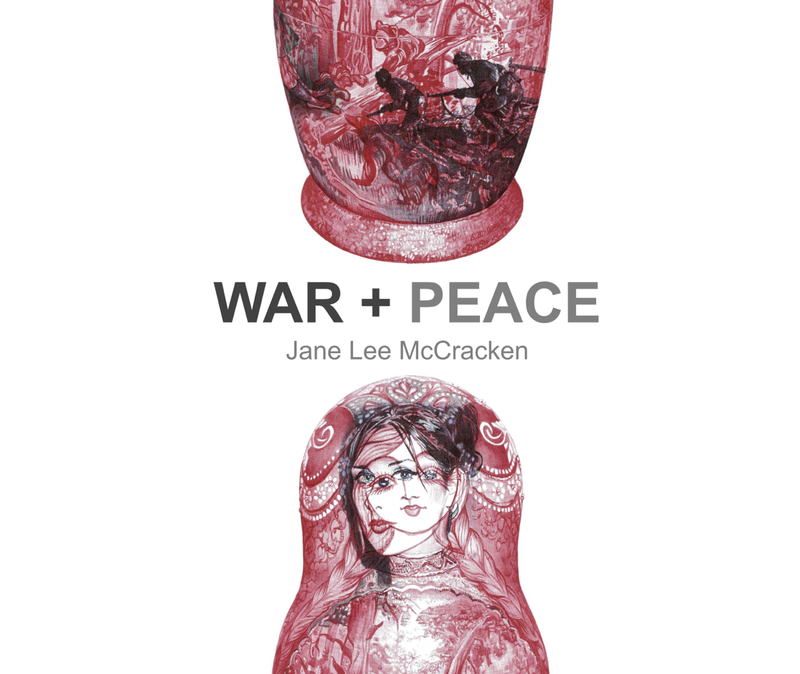 Greetings cards range depicting ‘Russian Doll’, ‘The Sideboards II’, ‘Sweet’ and ‘Our Forefathers’. In stock at Newcastle-upon-Tyne’s premier design store Whosit & Whatsit, Jane’s cards are now available to purchase from her online shop. Sets of 4 cards are individually wrapped with envelopes and priced at £10 including postage and packaging per set. This year’s original Biro drawing for the Wolf Conservation Center ‘Angel Girl’, is a portrait of Alawa one of WCC’s Ambassador Wolves. It focuses on Alawa’s haunting eyes which speak of the innocence of animals and implore consideration of the wolf’s integral role as a keystone species. There are hints of blades of grass where Alawa is lying to remind us of the wilderness, the domain of wild wolves. 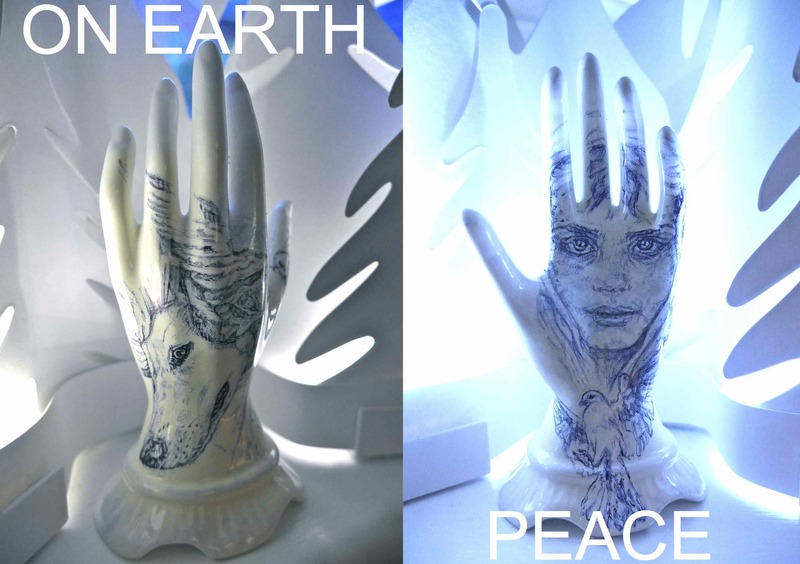 ‘Angel Girl’ will be sold by WCC to raise vital funds for wolf conservation. An A3 limited edition series of 50 signed and numbered archival pigment prints of ‘Angel Girl’ is now available with profits going directly to the Wolf Conservation Center. Howls from Alawa and the Wolves of WCC! 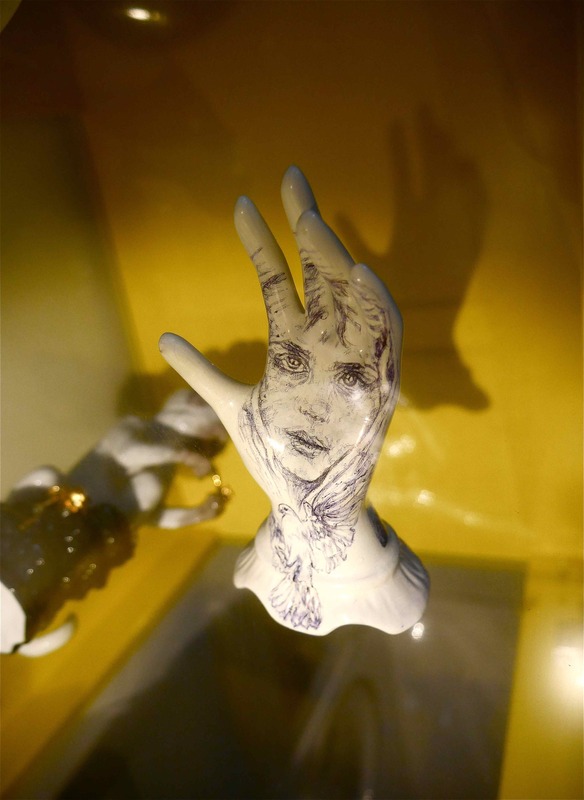 This year’s Christmas card focuses on the plight of refugees and animals caught in the crossfire of war through a little sculpture tattoo drawing in Biro on a found china hand. Season greetings and a happy and peaceful 2016 to all. 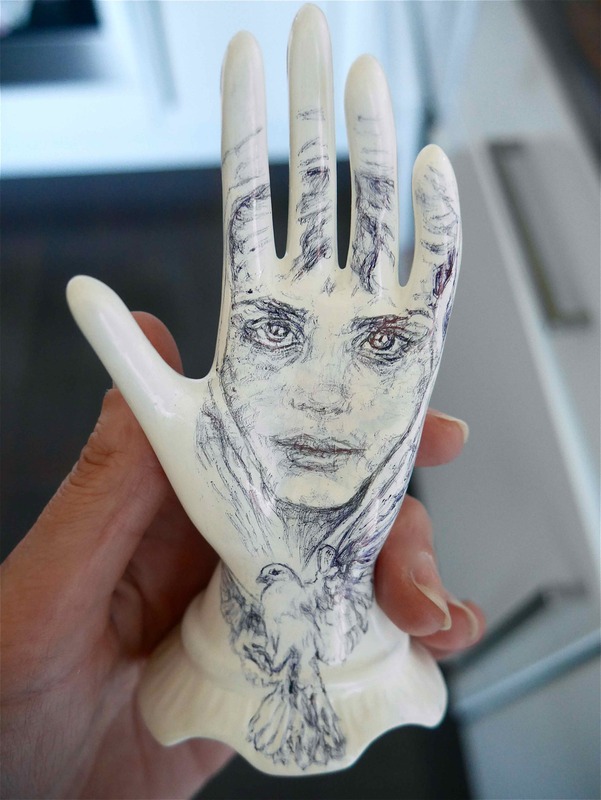 Biro drawing by Jane Lee McCracken, on a china hand purchased in a local charity shop. Reflection of dove drawing on the back of china hand. 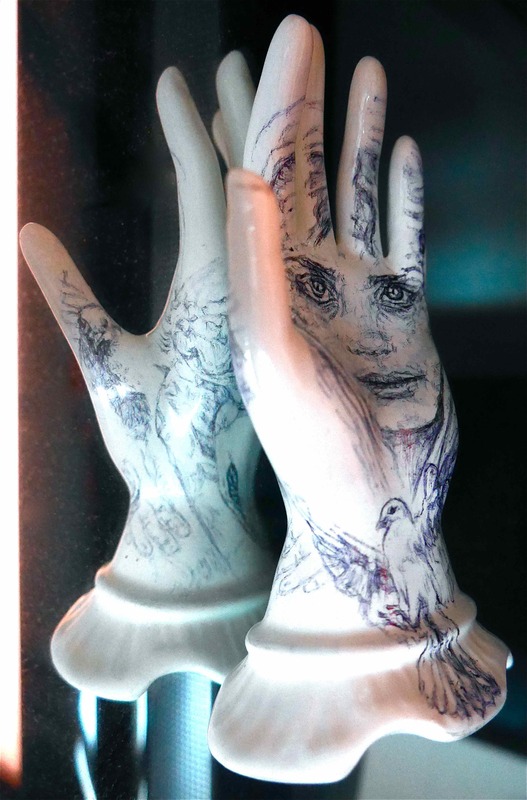 Reflection of back of china hand with drawing of Lily and dove. 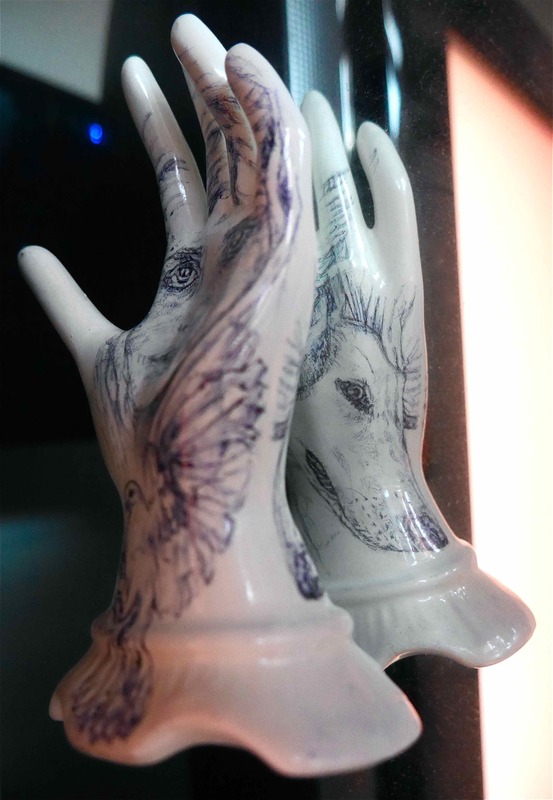 Sculpture tattoo on glass shelf. This October book No.1/50 of ‘War + Peace’ was auctioned at the Savoy, London and raised £400 for Save Wild Tigers, an organisation dedicated to saving the last 3,200 wild tigers. There is still time to order a copy before Christmas! 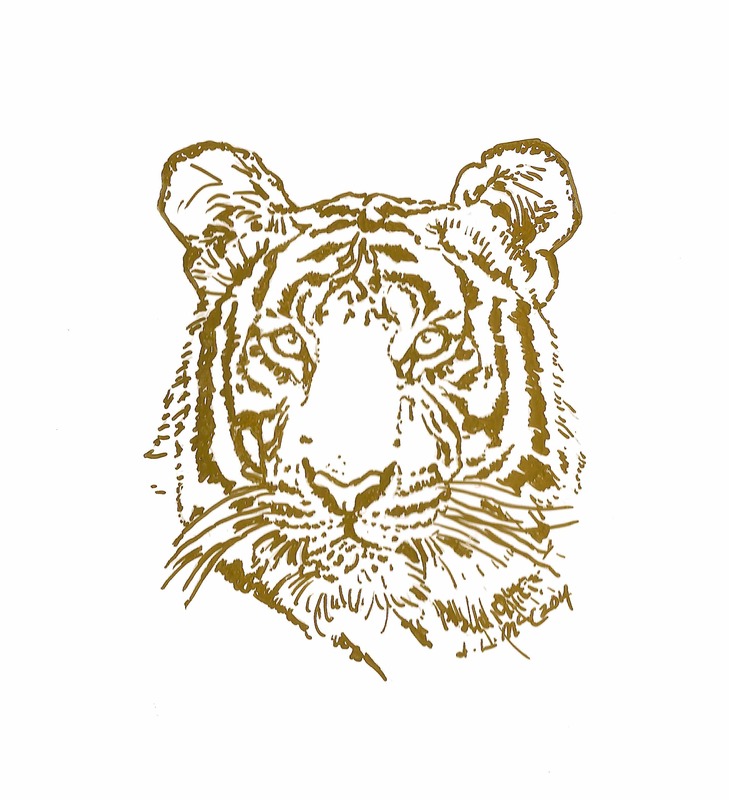 ‘War + Peace’ is a limited edition publication of 50 books worldwide, signed and numbered with an original gold tiger drawing made on the back page of each copy. To order a copy or for more information please visit my shop. Original Gold Tiger drawing on back page of each copy.